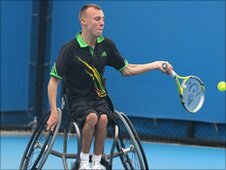 Britain's Peter Norfolk and Andrew Lapthorne beat America's David Wagner and Nick Taylor to win the Australian Open quad doubles crown. Norfolk and Lapthorne triumphed 6-3 6-3 to become the first all-British pairing to win a Grand Slam wheelchair tennis doubles title. Lapthorne also secured his first win over Taylor in the singles event. Norfolk lost in the singles to Wagner but is still in contention to reach Saturday's final. The two-time Paralympic champion lost 6-4 3-6 6-4 to the world number one at Melbourne Park and now faces a crucial match against Taylor on Friday with the top two players after the round-robin phase to go through to the decider. Lapthorne twice went a break up against Taylor before eventually taking the opening set on a tie-break. He then came from a break down to win five games in succession in the second set to seal a 7-6 (7-4) 6-4 victory. "It's a great feeling to win my first Grand Slam title and to be able to do it alongside Peter and share this experience with him is fantastic," said Lapthorne after the doubles win. It was the fourth victory in the last two years for Norfolk and Lapthorne over the two-time Paralympic quad doubles champions. "I'm sunburnt but happy for my first Grand Slam doubles title," added Norfolk, who is bidding for his fifth Australian quad singles title. "It's even more special to do it as a British pair. I'd like to say a massive thanks to the crowd. Andy played absolutely fantastic and I was there to back him up when needed," he joked. Britain's representative in the women's event Jordanne Whiley and her partner Daniela di Toro of Australia lost to reigning Wimbledon and US Open champions Esther Vergeer and Sharon Walraven 6-3 7-6 (7-2) in the women's doubles semi-finals.